Pete Moore installs fencing at Stockton 99.
and proudly discussed its ongoing resurrection. main grandstand and the area where he plans to build a children's play area. "We're moving right along," Noceti said. "We're fixing it up and updating things. We're right on target." 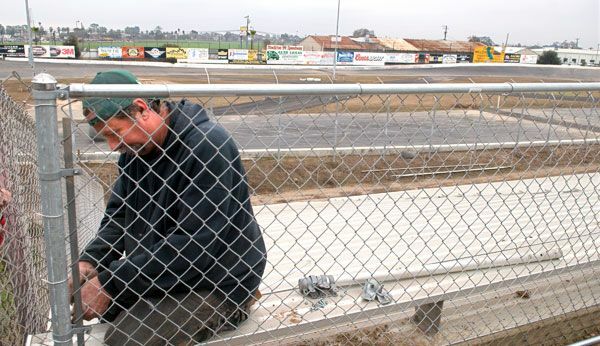 sessions with enduro race and destruction derby ($10 general admission), 5 p.m.
March 22: Grand opening, NASCAR racing, 1 p.m.
Noceti and his wife, Carol, who also manages the facility, are pleased with the progress they've made in returning Stockton 99 to its former glory. In 2005, the area's only NASCAR-sanctioned track closed after 60 seasons when its owners - Bob Hunefeld and Ken Clapp - sold the land to developers. The deal fell through because of the souring real estate market, and in August, the Nocetis signed a five-year lease to operate the facility. The Nocetis have since worked with paid employees and volunteers to clean up the track, which had fallen into disrepair. Though some work remains, the grand reopening is scheduled for 1 p.m. on March 22. That event will be preceded on March 14 with a warm-up show that will include practices and an enduro race. Some of the chores have been tougher than others. Tony Noceti grimaced as he walked on the aluminum bleachers in front of the main straightaway, which hold the majority of fans in the 5,000-seat facility. "I think the toughest thing was putting back in the bleachers," Tony Noceti said. "There were like 30,000 bolts. I'd never seen so many bolts. It took us six weeks to get it done. I was glad when that was over." The lights are up, aluminum bleachers soon will be erected in the first turn and a picnic area will be built behind them. "We really want to make this track as family friendly as possible," Carol Noceti said. "That's why the play area is so important. The night gets long for children, so we want a place where they can go and play during the events." Tony Noceti is in charge of the renovations and new construction, and manages the racing program. Carol handles the business end, such as contracting with vendors and setting up the concessions, advertising and promotions. They hope drivers will take advantage of the first chance to sign up for NASCAR licenses and car numbers at a car swap meet on Saturday from 8 a.m. to noon in Building 2 at the San Joaquin County Fairgrounds. Stockton 99 has been recertified by NASCAR and will run a program of Western Late Models, Grand American Modified, Pure Stock and Bombers. The season is expected to go through October. "We've already had a great response from drivers that want to come back here," Tony Noceti said. "People are excited." Carol Noceti said she plans to hold a jobs fair for staff positions on Feb. 7 at the Clarion Inn and Suites on Waterloo Road in Stockton. On March 14, the track will host practice sessions and an enduro race to make sure everything works before the official opening on March 22. "A lot of people have put time and effort into helping us get this going," Carol Noceti said. "I think it's going very well."